So what is The Significant Space all about? In a nutshell it's a source of information and inspiration dedicated to helping newly engaged couples find their perfect wedding space. Why am I doing this? Well, this is my way of giving back and serving others by channeling my knowledge and experience of the wedding industry into a resource that is currently absent but which I passionately believe is very much required. The wedding venue (or space as I prefer to call it) is the lynchpin to the whole event. Once the space is determined, everything else about the wedding is influenced by it, from the catering and styling to travel plans and location photos. A good wedding space will allow you to have the wedding you've always wanted - be it small and intimate or large and legendary; everything flows smoothly, good times are had, and your guests leave raving about how awesome your wedding was. On the other hand, some spaces may look good but tight restrictions, bad service and poor lighting can turn your special day into little more than a production line event that you're unceremoniously herded through. Not good. On top of that is the evolution of the wedding. When once weddings were simple ceremonies at the local church or registry office followed by a knees up at the RSL, weddings are now a reflection of our lifestyles. DIY and backyard wedding trends have empowered couples to incorporate their tastes in fashion, design, food, music and entertainment into an event that embodies what they love and why they are in love. And the space itself plays an integral part, hence the explosion in demand for alternative spaces such as industrial warehouse, boutique cafes, rustic farms and even bookshops. So finding a space that allows this kind of goodness is priceless. With all these considerations to bear in mind, how on earth is a newly engaged couple supposed to find their perfect wedding space? Before you say Google, try it out. Google "perfect wedding venue Sydney" and see what turns up. Is there anything on that first page that really stands out or inspires you? Or do they all look just a bit too similar? These are first hand reviews of spaces I've visited, and as I'm based in Sydney the spaces will be predominantly from Sydney and the main NSW wedding provinces of Southern Highlands and the Hunter Valley. But I will endeavour to travel to any place where I hear there is a space worth considering for inclusion. Selecting REVIEWS from the menu calls up a gallery of thumbnails. Clicking on one of the thumbnails leads to a preview of the review for that space. This allows readers to get a feel for the space with the option to either click through for the full review or return to browsing the thumbnail gallery. 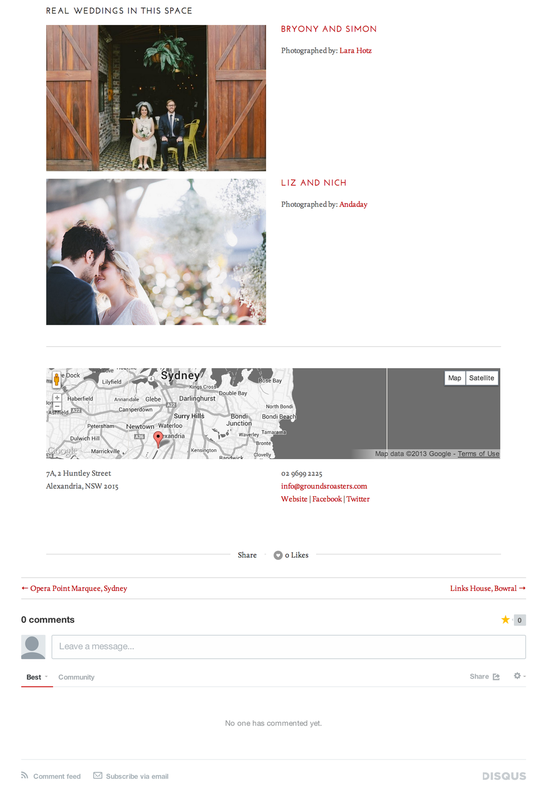 Clicking through to a review calls up a wealth of information on that space presented in a consistent format including a slideshow gallery, description, my first hand review, links to featured real weddings in the space, and full contact and social media details. Each review also allows for comments where I would love couples who have been married in the space, and wedding vendors who have worked in the space, to share their experiences and provide feedback. If a space receives consistent bad feedback I will consider removing it from the site. 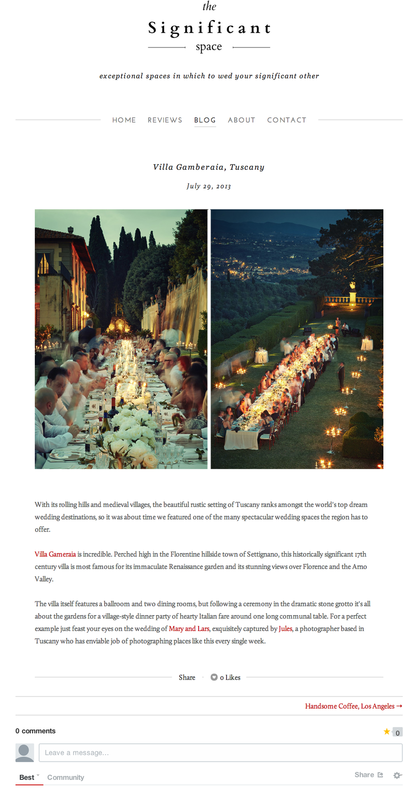 This is dedicated to showcasing exceptional spaces from around the world and real weddings in them. So whether you're from Sydney and planning a destination wedding, or you're an overseas visitor who wants to see more than just Sydney spaces, the blog should have plenty of inspiration for you. So there you go. The site's not 100% complete by any means and I need to add a lot more reviews to get it to a comfortable position, but What If? gave me the impetus to not f*cking waste any more time and put it out there for the world to see! Now to address the remaining theme: ask for help. I really believe The Significant Space can make a difference to people's weddings and give the wedding industry the shake up it deserves, and hopefully you can also see value in what I've created. If so I humbly ask you to raise awareness of The Significant Space so it can inspire and help as many newly engaged couples as possible. If not, please read all the above again! The easiest way you can help me is to Like the Facebook page (which will announce all new reviews and blog posts), then write a nice comment with a link to it, and suggest it to all your friends. After all, everyone knows someone who's just got engaged, right? Images from all the spaces are also on the Pinterest page so please feel free to repin them as much as you like. Finally a note to all my photography clients. The Significant Space is a labour of love but as I initially stated, it's a personal project, not a business. So rest assured my wedding photography comes first but by its nature The Significant Space will continue to grow as my wedding adventures uncover more gems for review. Thank you so much for your time and your help and I would love to hear any feedback, comments or suggestions you have. Milton.